Glens have always been a working terrier. Their working capabilities were prized over and above their looks. 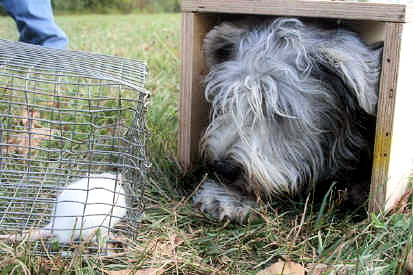 Even when the breed was accepted into the Irish Kennel Club, it could not earn an IKC Championship without also passing two working tests, one for drawing a badger out of its den, the other for catching a rat that was escaping across a stream (so the Glen had to go through water, which they normally are not fond of). Glens were disqualified if they vocalized during the test. Glens were “dead game,” meaning they were so intent on the game, they would absolutely not quit until the job was accomplished. 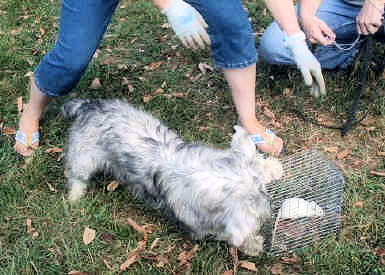 When not working, they were expected to be gentle and docile. Today, the Working Certificates are no longer a part of a Glen Championship, but the attributes of a breed that was maintained primarily for its working abilities and temperament carry over into many modern-day talents. Glen of Imaal Terriers are very intelligent, sensitive, and capable of doing a wide variety of things. They are content to simply hang out but they love to do things with their owners. Glen owners & their dogs have fun & get loads of exercise in Agility, learn more leisurely & useful skills in Tracking, comfort shut-ins with Pet Therapy visits, and maintain the breed’s original instincts through the safe and humane sport of Earthdog. 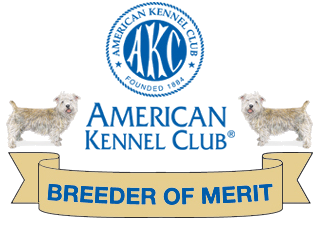 One Glen owner, Monique Anthony, enjoyed Earthdog with her Glens so much that she became an AKC Earthdog judge and helped develop a special Strong Dog test for Glens in order to demonstrate the additional expectations of the original working Glen. The following film clip demonstrates some crucial elements of the working characteristics of Glen of Imaal Terriers: their willingness to please, intelligence, gameness, and the significance of their laid-back attitude. Willingness to work and please the owner. get to their food fast! invited by the owner. So, she never crosses the threshold of the gate. 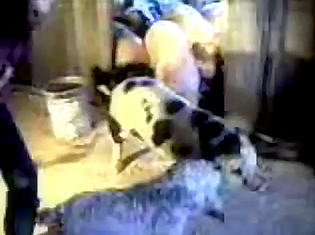 The pigs obviously respect the dog, whose barking is normally sufficient. However, pigs are called pigs for a reason, and when the food doesn’t come as soon as expected they get bolder. Duffy reminds them with snapping teeth and, if needed, nips on the nose. When the pigs do as she tells them, she leaves them alone. One particularly stubborn pig still thinks it has a chance, and when Duffy’s back is turned, it comes completely out of the pen, leading the others. Duffy swings around and gives it a couple of stern nips in the ear/neck region, turning it and sending it back and its companions back where they belong. Then, when her owner goes in the pen to feed the pigs, she knows her job is done. 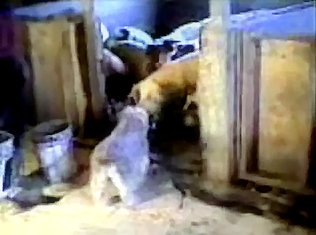 Duffy was as effective with 600 pound sows as she was with these 120 pound growing pigs. This video was taken when she was 7 years old. We discovered she had PRA when she was eight years old, she was blind at age ten. She adapted to her loss of sight even in our active and continually changing farmhouse environment. Duffy passed away in 2000 at age twelve, and sometimes we still accidentally call the other dogs by her name. Although Glens were traditionally strong dogs for earthwork, used to pull badgers out of their dens, this video clip demonstrates that they are very versatile working dogs, trainable and adaptable to many situations, including less rural vocations such as agility and therapy dogs. Earthdog training maintains the breed’s original instinct while protecting both the dog and the prey. Liberty’s Kiss of Kismet loves doing agility with her owner Lynn Denton. 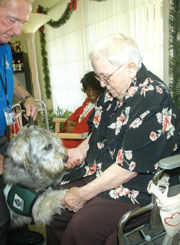 Liberty’s Torrence P. Co. Craven visiting a nursing home with owner Sam Pearson.